PHILADELPHIA (CBS) – Firefighter Mike McGuire is fighting for his life at Pennsylvania Hospital after being hurt in a high rise fire on Wednesday. Members of the Philadelphia Fire Department went through a training exercise in Center City Saturday to prevent this from happening. Battalion Chief Mike Irachi (photo, center) is directing traffic as some firefighters take hoses up to the fire floor while others search for victims, "... just in the process of making a rescue. I'm going to need you to get the medic unit up." 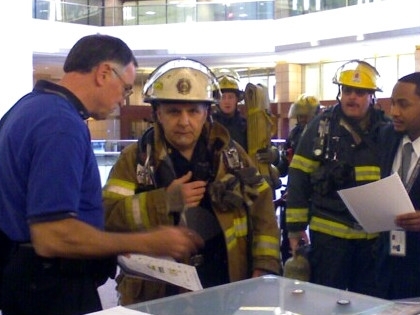 The 16th floor of Center Square at 15th and Market was overcome with simulated smoke. It's all part of a training exercise designed to enhance efficiency when battling high rise blazes. Curtis Massey (photo, far left) is a former firefighter who founded a fire safety and disaster planning firm that has clients nationwide, including many of the high rises in center city. "We did classroom training yesterday for eight hours; then today it is practical. Just work on refining the skills pertinent to high rise search and rescue and fire attack procedures." Three more drills are scheduled before the end of April.